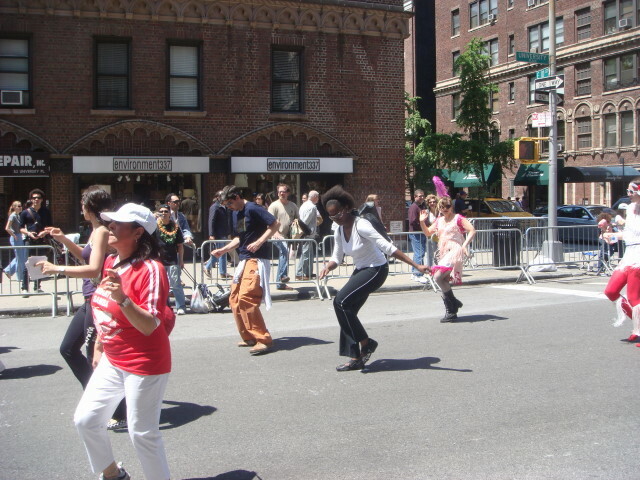 Oddly enough, or perhaps it is to be expected, NYC has a parade dedicated just to dance. Take your pick of the dance style. I didn’t note any minuet, but I think I saw variations on just about everything else. Well, come to think of it; no square dance section, either. Man! I wuz robbed! The parade had perhaps the weirdest route I’ve ever seen for a parade. It started up on 31st Street heading south on Broadway; then it cut over to University (just north of Union Square); and then hung a left on 8th Street to end in Tompkins Square Park. Well, at least that’s what I heard. I stayed around 10th and University for the whole parade. And it did last quite a while. I think I’m gonna get about three posts from it. And, now, on with the first post. The parade started at 1pm, but we didn’t see anything in the Village where I was standing until about 1:40. They may dance hard, but they parade slow. The parade was eclectic to say the least. It had a lot of international dance, but it seemed mostly to consist of dance companies. And not a single marching band! Not one! Where was Mother Cabrini’s? 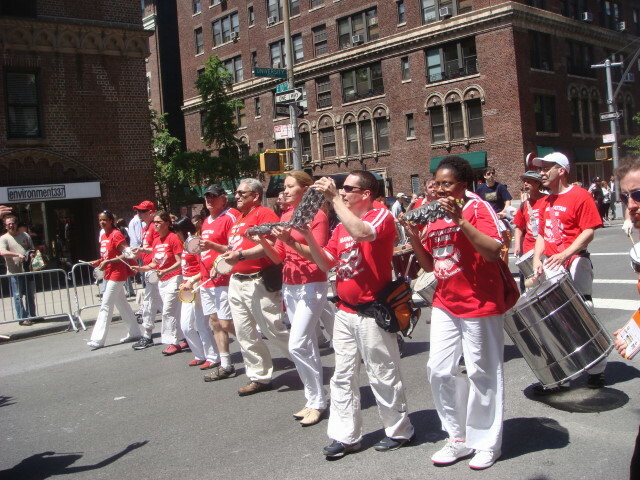 Where was a dancing marching band? Nevertheless, it was a highly enjoyable parade and the dancers were almost all having a grand time entertaining us and each other. First up, some sort of Caribbean dancers. Or were they just belly dancers? Caribbean belly dancers? But to be honest, the real stars of this group were the musicians. The dancers were fine; the musicians were great. Then a group called Pure followed. A really nice little show where they did mostly, I guess, what is considered an interpretive dance of some sort. 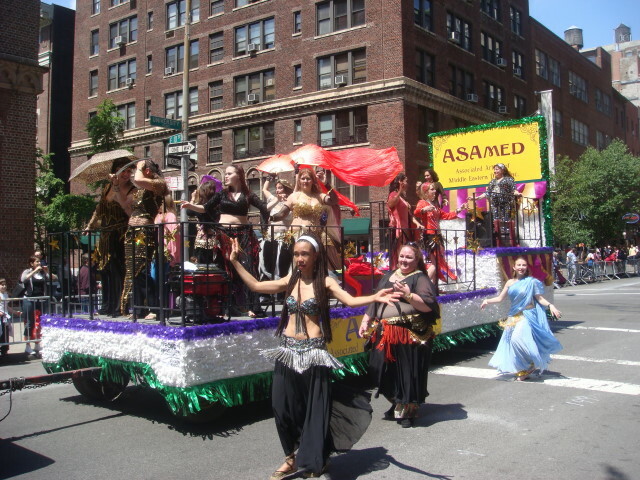 Here’s the ASAmed group, at least where they were clearly identified. I really regret that my photos don’t capture the actual movement of the dancers. When you see the dancers with their hands out, don’t even think they were posing. These ladies were dancing up a storm. 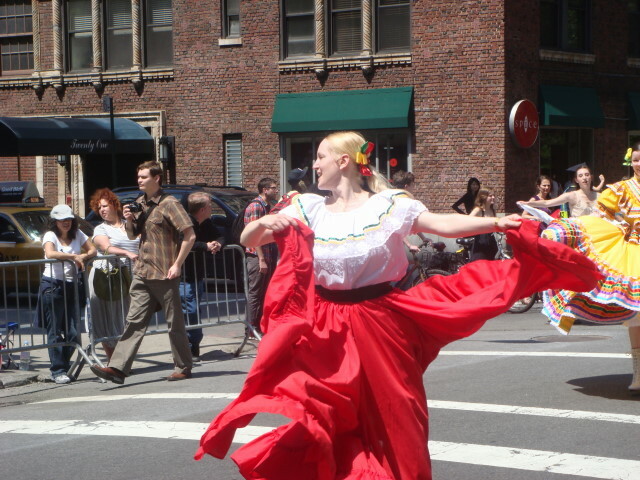 All I can say about the below picture is that this dancer was following a Mexican float/bus of some sort. I cannot place the outfit into any sort of mental category in my head. I really loved the Korean Institute of NY’s display. They actually had a number of dancers and everyone was about as colorful as you could hope for. The picture below captures my best moment of watching them. In the others, they are a lot more scattered and you can’t really catch the movement and the impact. Or, at least I can’t. This was a group of Polish dancers. Probably. They had a flag that I think was the Polish flag (red and black, double-headed eagle). Here’s the start of what I considered the best part of the parade (out of a pretty good parade). 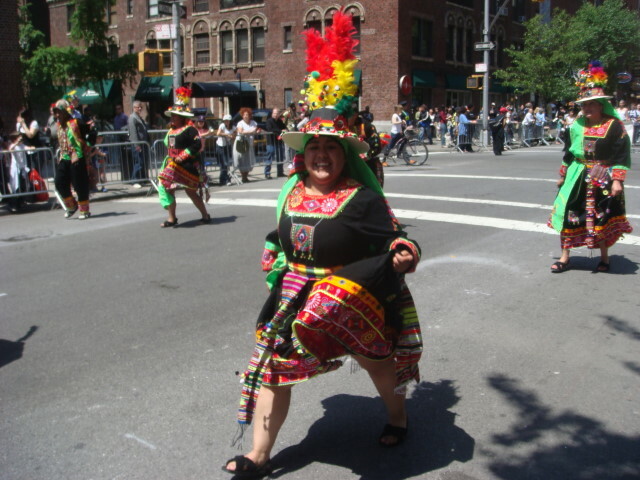 The Bolivian dancers were intent. Wow, oh wow; they were intent! The young lady at the center of the picture was utterly consumed with the passion of her dancing. It was almost scary. They stopped for a moment and all of the ladies crouched (well, there were some guys, too). Then, all at once they popped up and started dancing again. And this young lady wasn’t going to let anything make her miss her cue. It was just the look in her eye and the way she just wouldn’t let up glancing at the others to make sure that she and they were all in sync. Very fun, at least for me. And it was fun for this woman, too. She just had the biggest smile. The more “interpretive” or modern or contemporary or whatever-ya-wanna-call-it style then seemed to take over. I never again saw the passion and the communal action that the Bolivians had. The rest was fine, but perhaps just a little too laid back to stand close comparison with the Bolivians. The next picture was of a group called “Contemporary Dance Theatre”. They were way too laid back to follow up on the Bolivians. And they either knew it and didn’t try or they thought they were too cool to be as energetic. This is one of the few moments that they were dancing when they walked by me. That isn’t to say they weren’t big on dancing in other places; all I’m saying is that you couldn’t prove it from what I saw. 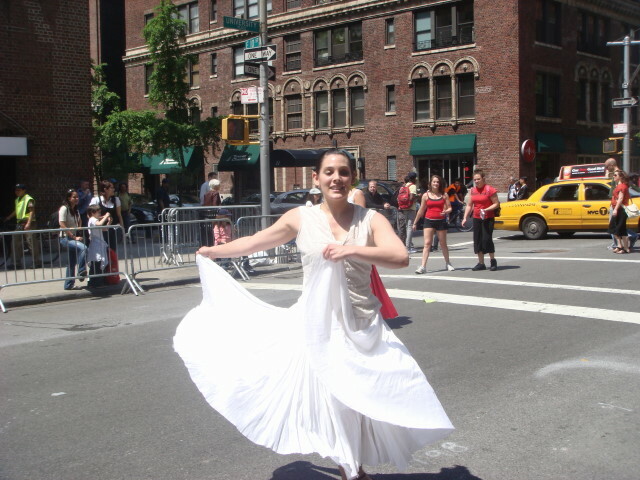 The East Village Dance Project followed. 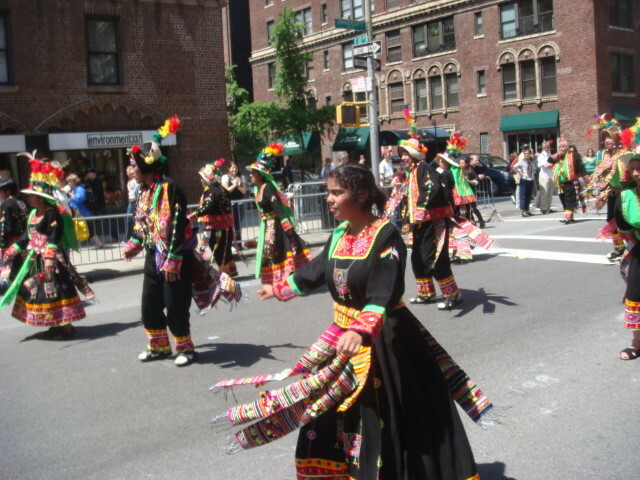 They had some interesting stuff, but there was still something of a vacuum from the passing of the Bolivians. Of course, these were mostly kids and probably shouldn’t be compared to the others, anyway. Now, the Neville Dance Theatre did start to bring back some life. 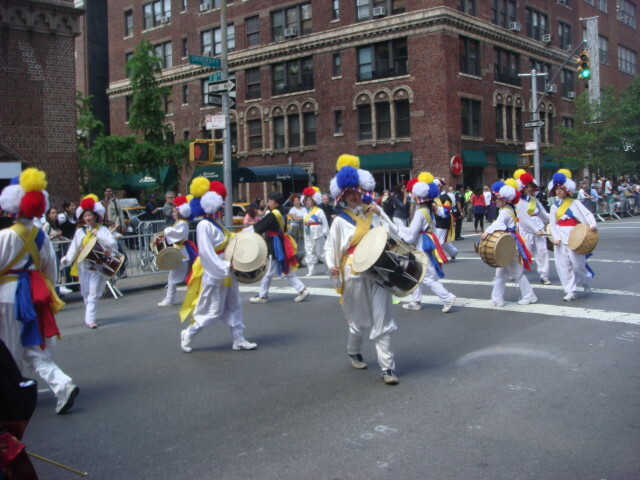 They weren’t as numerous or as passionate as the Bolivians, but they were very, very good. As you might expect, I did enjoy the moments above and below. The dancers were having fun and enjoyed having their pictures taken. Thank you. The Amy Marshall Dance Company was pretty good. I got a number of shots of them, but I just don’t think I captured their energy. In the picture below, you can see some of the high kicking going on in the background, but it was a bit spread too out for me to really capture. 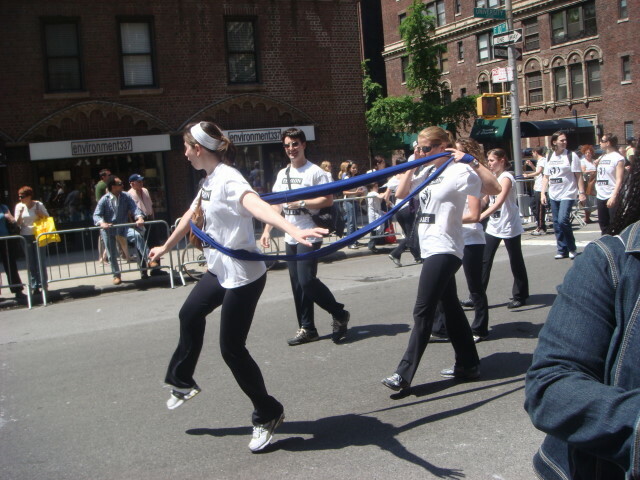 A lot of the dancers were very young and were very bendable. The next group that came was, I think, something about “Luigi’s Jazz”. At least, that’s what was on the back of the guy in the stilts. Maybe that’s Luigi in the back of the car. No other sign of who they were. That’s the end of my first post on the parade (I think it may end up as three posts). There were a bunch of great moments during the parade and I hope to point out the rest of them. It was a nice day and a nice parade with some good music and no really bad music. There were a lot of dancers out there to strut their stuff and a number of oddballs who wanted to show how odd they were. 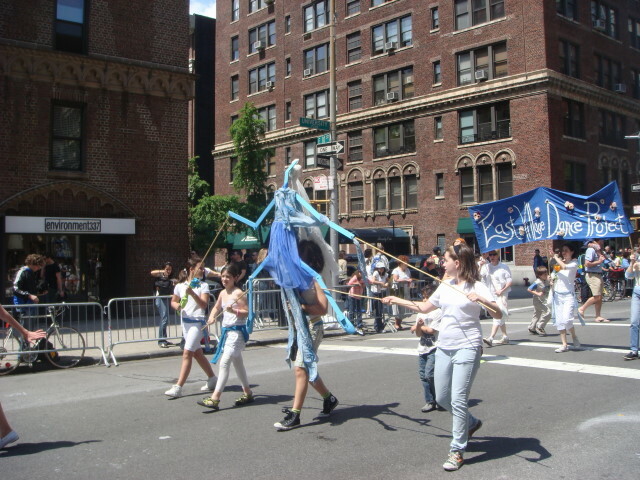 There were even, strange as it seems, some political aspects to the parade, but not in the manner you might think. I’ll cover it in tomorrow’s post, but I honestly don’t know if they were just pulling a scam (probably) or making a point (seemingly a really minor point, if so). But you have to wait to see that. 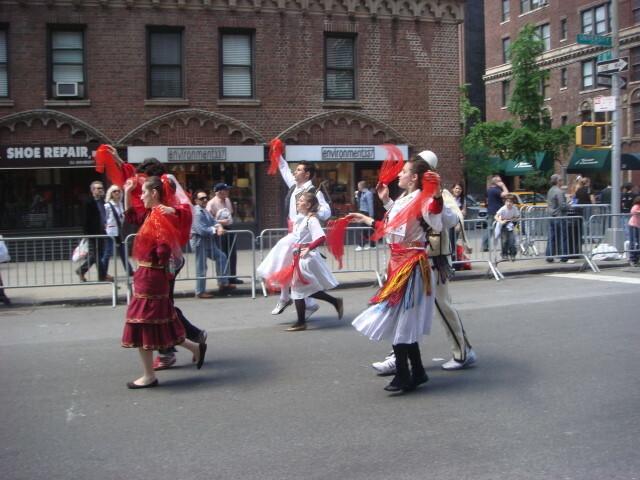 This entry was posted on May 18, 2008 at 5:23 am and is filed under Events, Greenwich Village, Manhattan, Parades. You can subscribe via RSS 2.0 feed to this post's comments. You can comment below, or link to this permanent URL from your own site. 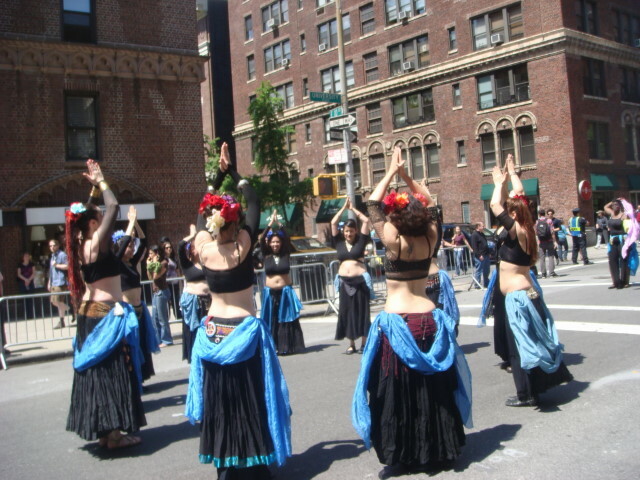 The Belly dance group with the blue veils above is called Pure. 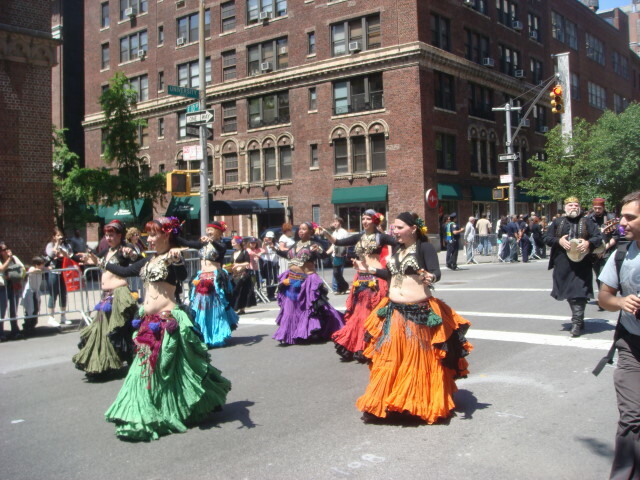 The Troupe with the Dancers with the colorful skirts is called Manhattan Tribal. This is an American Tribal Style inspired troupe. Yes, that is indeed Luigi in the car. 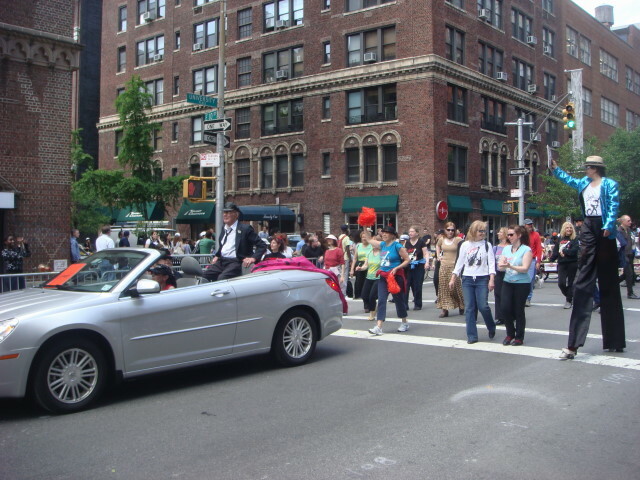 He was actually the Grand Marshal of the parade, and there was a sign on the car. And one on the trunk, but hard to read that from ground level. Dancers from Luigi Jazz Centre followed, including Ken on stilts. He is still teaching classic jazz dance every day at his studio, at age 83! Wouldn’t it be great if you could customize a pllayist of routines to watch on demand through netflix, online, or on a dvd? I know when I get in the mood to watch excellent dance to lift my spirits during the non-summer season, I end up watch Netflix’s LXD on demand, or a Step Up franchise if it’s available. There have been several brilliant, memorable routines through all the season and cast members. If you allow viewers to make their own pllayist of favorites, not only do you gain the loyalty of viewers (which, let’s face it, you’re fox, you have a couple generations before that is a non-issue), but you also get data on what dancers and choreographers have the resonance necessary to obtain a level of indisputable respect and a devoted following. Utilize the resources you have. So much talent.